Falling on April 22nd, Earth Day 2017 is just over a week away. At Larry & Sons, we believe in making environmentally friendly choices whenever possible, and we strive to help our customers reduce their energy consumption not just on Earth Day but throughout the entire year. Whether it’s energy efficient HVAC systems or plumbing fixtures that are designed to minimize waste, we have what you need to make small changes in your home that will make a big difference. In honor of Earth Day 2017, we’ve put together this list of easy ways to reduce energy consumption. Install drapes. Putting up drapes makes your home look great, and it can reduce heat gains by as much as 33%. Use an advanced power strip. Fight energy vampires by using advanced power strips. Switch the strip off when you aren’t using your electronic devices, and you could save $200 per year. Maintain your air conditioner. Taking good care of your home’s cooling system boosts its efficiency, reducing its environmental impact. Replace your filters regularly, and make sure vents aren’t blocked by furniture or clutter. Keep the doors and windows closed. When you have your air conditioner or heat turned on, make sure all the doors and windows in your home are securely closed. Upgrade your water heater. 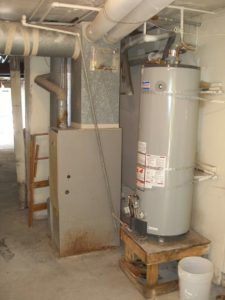 If you have a conventional water heater with a storage tank, upgrading to an energy efficient tankless water heater will drastically cut your energy consumption and lower your bills. Seal air leaks. Leaky air ducts waste tons of energy. Commit to having your air ducts sealed this year, and you could save up to 20% on your heating and cooling bills. Invest in a programmable thermostat. With a programmable thermostat, you can enjoy a comfortable home while you’re home and give your HVAC system a break while you’re away. When properly programmed, you could reduce your heating and cooling energy consumption by up 10% or more. Looking for more ways to reduce energy consumption? Larry & Sons can help! We offer energy efficient solutions for any situation and budget. Call 301-733-5428 today to learn how we can help you reduce your impact on the environment and save on your monthly bills!